Brampton, ON, is beautiful—yes, we deal with the cold, but we’re accustomed to it and appreciate its beauty! We may be averaging below freezing temperatures right now, but it won’t be long before the thaw comes, the snow recedes, and the sun floods our homes once again! Summer nights are on the horizon for Brampton residents (even if the temperatures suggest otherwise)! Soon, gatherings and grill-outs, sunsets on the porch and coffee with the sunrises, stargazing and moonlit dinners will be on the schedule. What better backdrop to all of this than a beautiful new or replacement patio door? Rotting patio door frame: let’s get this out of the way—this is not repairable. Deteriorating frames call for a replacement. Most importantly, beyond the eyesore, a weakened frame means compromised security for you and your loved ones. Further, energy performance and operability will likely decrease more and more over time. Sticky sliding patio door: when the easy operation of your current patio door becomes a struggle, give Brock a call. If we can, we will repair this issue and have it working like new in no time. If not, we will go over your options and guide you around our showroom to generate new ideas. Eyesore patio doors: this issue is generally unfixable without replacement. For you DIYers—go ahead and try sanding and painting. If that doesn’t work, give our team a call. Unsightly appearances due to denting, peeling, warping, or blistering is a clear sign it is time to upgrade. Easy access to Brampton’s great outdoors! Brampton sliding patio doors are the perfect option for any host. In fact, you can have your hands full and still have easy access to move in and out as much as you need while hosting a get-together, watching the kids play out back, or bringing in groceries. Also, something magical happens when we feel more connected to the outdoors. Call it refreshing, rejuvenating, or a spiritual need being fed—whatever it is, the connection of the indoor space to the outdoor space is special. Huge glass panes as found on many patio doors create the illusion of a larger space and opens up entire rooms. This can help to capitalize on your kitchen space, bedroom, and living room, as well as your patio or deck. Ready for summer? We sure are! Patio season will be upon us before we know it. 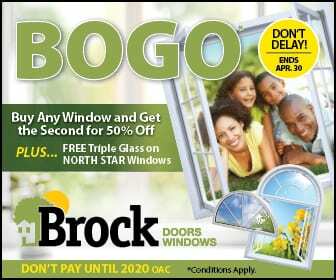 Give Brock Windows and Doors a call; we cannot wait to meet you!